Emily's - The Bronte Birthplace01274 834853work Tea/Coffee ShopThe Bronte Birthplace, Emily's by De Luca Boutique - Coffee House, Tea Room & Delicatessen. The Bronte Birthplace is now open offering ground to order coffee, a variety of loose leaf teas, award winning botanically brewed drinks and vintage cordials together with fine foods. 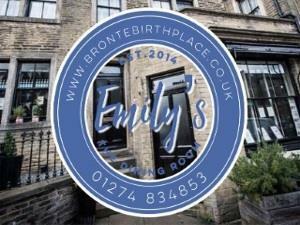 The Bronte Birthplace, Emily's by De Luca Boutique - Coffee House, Tea Room & Delicatessen. Group bookings can be arranged outside these hours. Please contact us to discuss.